Everything you do has consequences and sometimes side effects. Many times those consequences and side effects are completely unexpected. I am living that right now. When I launched the new website 1 January I THOUGHT I would be doing more work at trade shows and culinary events because, well…I am, after all, a culinary event coordinator. However my business has taken an S curve! New and different people started reading my blog and I am now one of the contributing writers to Las Vegas Food & Beverage Professional. I am primarily covering openings and events and I LOVE it. My first item will debut in the April issue and of course I will post it here. I have also been approached by a local concern about writing for them on one of my fave topics – BEER! Unexpected side effect! I have been offered several catering jobs (only one of which I accepted) and I am glad to do it. It’s a rehearsal dinner for a wedding in August. Relaxed, family style food that I excel at. Then I got a call from our local nature park, Springs Preserve, to work with them on a series of three live cooking classes. With over 1000 demos under my belt I jumped at the chance! I have been teaching people to have fun in the kitchen for more than 15 years, so it’s a seamless progression for me (Moment of Truth – I am a little nervous about no one showing up, so you can buy your tickets here. It is reservations only and there is a fee, but you get to eat!). Unexpected side effect! Lastly, to round out the picture, I have been working with Texas Pete Hot Sauce for four years now. It was Chef Michael O’Donnell’s glowing praise that made me pause and consider that MAYBE I could do for other people what I do for them. Until four years ago I had used hot sauce only as a condiment, rarely as an ingredient. Boy how things have changed! I have been more deeply exposed to the wonderful world of Southern Cooking and I am forever grateful. 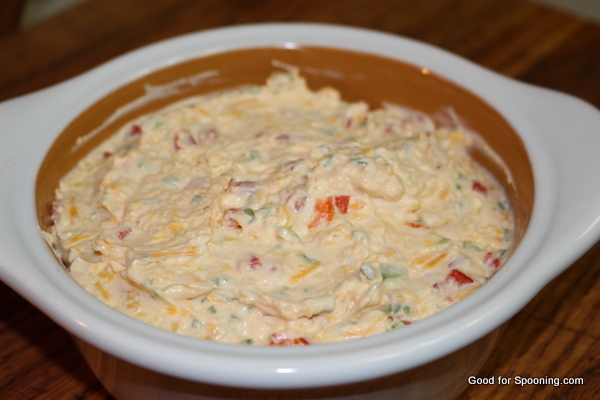 On a recent trip to Atlanta for a trade show I ate my weight in pimento cheese. I enjoyed it so much that I had to make my own version. Needless to say, as a Yankee, I am sure mine is not traditional, but my friends and I like it and I am sharing it with you here. It’s all a guideline, like most recipes are, so tweak it (not twerk it) to your individual taste and may I suggest having it on a cheeseburger instead of other cheese…yes, really. Enjoy this Unexpected Side Effect. 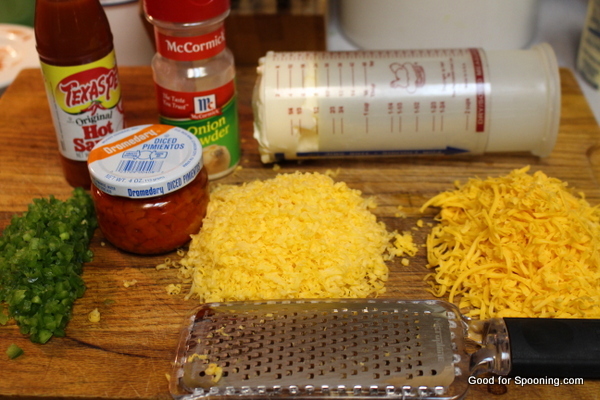 Combine all ingredients except the pimentos and coarse cheddar in a bowl. Using an electric mixer on medium speed, beat until well combined and fluffy. Fold the remaining ingredients by hand so they don’t get too mashed up. Refrigerate to allow flavors to meld (overnight is best). Serve with crackers. Makes about 3 cups. Want this. In my life. RIGHT NOW! So Texas Pete's is one hot sauce I haven't worked into my condiment cabinet-I've had it before, but I guess I've just never seen it in stores so have never picked any up. Anyway, when I finally live my dream of having a hot sauce bar in my house, I'll make sure I have some Texas Pete's in there!